Sharpen The Saw is a conversation about planning and continuous improvement. Sharpen The Saw discusses self-renewal, self-care, self-respect and self-improvement… so as the last chapter of The 7 Habits of Highly Effective People, I believe this chapter also represents why most people initially decide to read this personal change book… their desire to improve. I see the previous 7 Habits as being foundational… and if you work with them, the previous 7 Habits build a very necessary and helpful foundation that will serve you well. So… how do you Sharpen Your Saw? What is changing in my industry? How can I help others improve? I also Sharpen The Saw by focusing on personal well-being. Quiet time, rest, exercise, giving back to my community, enjoying family / friends, being creative, enjoying art and music are all activities for which I make time. Whether we are speaking of people, departments or organizations, Sharpening The Saw must be balanced across these four ‘dimensions’… otherwise an imbalance would be created. We can offset an imbalance for a while, but not long-term. When organizations ignore four-dimensional balance, inefficiencies, defensiveness and lack of synergy (Habit 6) ensues creating a loss in productively, customer satisfaction and ultimately profitability. Sharpening The Saw is an ongoing process of personal change – not something you can binge – like your favourite TV show on Netflix (which I sometimes do). You need to define your own balanced, four-dimensional life to be successful! If you are a leader, I believe part of your role is to help the people who report into you and/or look up to you (your family), explore these dimensions and establish goals for themselves. We all have busy lifestyles; therefore it’s no surprise we have to insert Sharpen The Saw into our Time Management best practices and make it part of our Quadrant II priorities (Habit 3). Our future success and ongoing reputation depends on us taking action. Stephen says, “It means exercising all four dimensions of our nature, regularly and consistently in a wise and balanced way. To do this we have to be proactive.” I love the words exercise and balance. Proactive means we have to plan for it – to put it in our schedule and protect the time (Quadrant II), for all 4 of the above mentioned dimensions. Self improvement takes time – just like working out and getting fit. 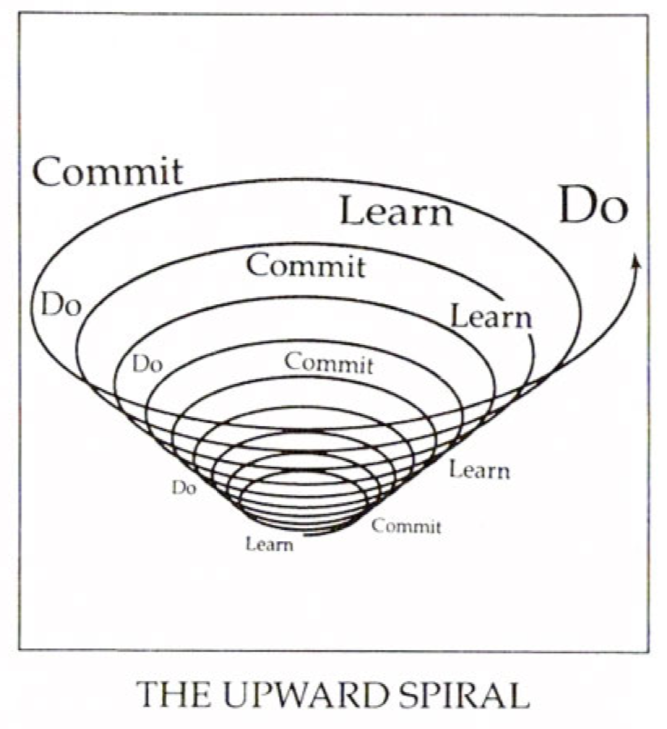 Stephen sees self-improvement as a never-ending upward spiral of ‘Learn, Commit, Do’. Personally I see it as a never-ending spiral of ‘Commit, Learn, Do.’ No matter what your preference of order of those three words, The 7 Habits of Highly Effective People is something you have to be mindful of and continually practice. When you begin working out, a trainer will help you receive maximum benefit and minimize injury. In the same vein, a personal coach will help guide your personal change and keep you on track. What Is Your Purpose? What Are You Committed To? Sharpening The Saw is anything that will help you renew your energy and keep you balanced. Again, how do you Sharpen Your Saw (keep the four dimensions in mind)? Cooked all night with your family / friends because you love to cook not because you have to cook. Stephen R. Covey suggests targeting 1 hour / day to focus on Sharpening Your Saw. If that works for you then terrific. Over time remembering to Sharpen Your Saw will get easier to plan and do. 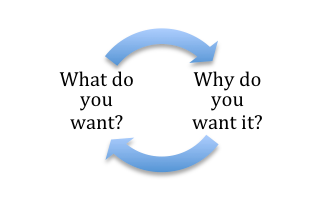 Whatever you choose will become a feeder into a life of quality – the glass half full – abundance of your life. Click here to join our priority list of people who receive our latest Business Communication blog posts. Bruce Mayhew Consulting facilitates courses including Email Etiquette, Managing Difficult Conversations, Multigenerational Training, Time Management and Mindfulness.